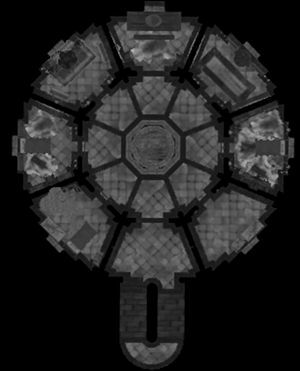 The Hall of Countenance is the main living and sleeping quarters for most of the higher ranked mages of the College of Winterhold. Several mages have their cubicles and beds in this area, including Drevis Neloren, the master Illusion trainer, and Faralda, the master Destruction trainer. It is one of two sleeping areas at the college, the other being the Hall of Attainment. There is a trapdoor to the Midden at the bottom of the stairs and an arcane enchanter and an alchemy lab upstairs. There is also an alchemy lab in Drevis Neloren's bedroom on the bottom floor. The hall can be accessed via a doorway in the southern part of the courtyard. Each floor is split into eight sections or cubicles, there are three cubicles on each side with the entrance and stairwell opposite each other and separating them downstairs. Upstairs the dining room and stairwell do the same. The stairwell continues up to an exit onto the roof, from which you can access a similar entrance at the top of the Hall of Attainment, there are two entrances to The Arcanaeum. These are on either side of the tower that reaches above the two halls. Most of the sleeping quarters contain barrels and sacks of food. There are also many bottles of alto wine, wine and Nord mead. All wardrobe found within the hall contain various items of fine clothes. There are many pieces of fine crockery including goblets, plates, bowls, etc throughout the hall. Items in cubicles that are assigned to specific people are generally owned and taking them will be considered stealing. Upon entering the hall there are college banners on either side wall and a focal point that is releasing magical energy upwards in the center of the lower level of the tower. Proceeding clock-wise around the floor the first cubicle is an unused bedroom with an unowned single bed coming out from the wall with small bedside tables on either side. On the table on the left is a large coin purse. To the left of the bed is a tall wardrobe and two chairs. On the right is a set of shelves holding two samples of giant lichen, a bowl of glow dust, a bowl of ectoplasm, and three deathbell flowers. To the right is a small cupboard with a three soul gems, a filled petty and common and an empty lesser soul gem. The second cubicle has a large vat, some crates and barrels. It is also one of only three possible location you will find Tolfdir's Alembic you need to find in order to help Tolfdir in a repeatable quest. The third is Phinis Gestor's sleeping quarters it contains an owned bed coming out from the wall with small cupboards on either side. The cupboard on the left has a mammoth tusk and flute on top and an unowned bottle of Nord mead on the floor in front. The cupboard on the right has a filled lesser soul gem, a medium coin purse and ten loose septims on top. To the left of the bed are two tall wardrobe separated by a set of shelves holding a small and medium coin purse, a potion of enduring invisibility hidden inside a basket, a potion of minor magicka, a potion of magicka, a potion of plentiful magicka, a potion of extra magicka, a potion of health, a potion of resist magic, a potion of brief invisibility, three sweet rolls, a long taffy treat, an apple pie, a drum and a lute. To the right of the bed is a narrow table with a couple of loaves of bread and green apples. To the right is a chair with a plate of two boiled creme treats on a barrel to the right. Next is the stairwell with a trapdoor into The Midden at the bottom. Continuing around the next cubicle is Drevis Neloren's sleeping quarters and contains an owned single bed coming out from the wall with end tables on either side, the one on the left has a small coin purse on top. To the left of the bed is an unlocked long chest with two wall shelves above. These hold a staff of magelight, three loose septims, five soul gems, two empty petty, two empty lesser and a filled common soul gem. To the right are two tall wardrobe separated by a small cupboard with an alchemy lab on top and a wall shelf above. To the left is a barrel containing ingredients, with two torchbug thoraxes and a bowl of frost salts on top and an unowned chaurus egg on the floor beside it, while to the right is a chair. Beside the lab, on top of the cupboard is a deathbell flower, a dragon's tongue flower and a bowl of bone meal. On the wall shelf is a giant's toe, a Falmer ear, a bowl of fire salts, a bowl of ectoplasm, potion of cure disease, a draught of health, and a potion of enhanced stamina. The next cubicle is a dining room containing a long wooden table with various foodstuffs on top. There are three loose septims on the floor to the right, by a barrel. The final cubicle is Faralda's quarters and contains an owned single bed coming out from the wall with sets of shelves on either side holding a steel mace, a steel dagger, a medium coin purse, seven loose septims, a basket containing three rock warbler eggs, three samples of hanging moss, two hagraven feathers, three hagraven claws, a sprig of elves ear, two ice wraith teeth, three pieces of canis root, a two chaurus eggs, a Falmer ear, and a piece of creeper cluster. To the left is a tall wardrobe and a chair, while to the right is a table and chair with a baked potato on top of the table. There are two wall shelves above the chair and a sweet roll on a barrel by the doorway. There is a hole in the center of the room with the magical energies from below rising into the ceiling. Around this is a low wall to prevent accidental falls. The first cubicle on the left is an unused bedroom containing an unowned single bed coming out from the wall, with several crates, barrels and an unlocked wooden chest around the cubicle. The second cubicle is Sergius Turrianus' sleeping quarters. It contains an owned single bed coming out from the wall with small cupboards on either side. The one on the left has a medium coin purse on top. To the left are two tall wardrobes separated by a chair. To the right is a narrow table with a bunch of juniper berries, a Falmer ear, a bowl of ectoplasm, a bowl of frost salts, a bunch of lavender, a deathbell flower, and a piece of canis root, with a barrel to the right containing ingredients. The third cubicle contains an arcane enchanter with an unlocked display cabinet on either side containing soul gems; there are two empty and two filled common, a filled lesser and three filled petty soul gems. Above the cabinets are wall shelves, the one of the left has a row of skulls on top, while under the cabinet on this side is another of the three locations you can find Tolfdir's Alembic. You are free to take these soul gems. The next cubicle is a dining room with a long wooden table and bench filled with foodstuffs, on either side are chairs and barrels, on top of one of the barrels to the right of the dining table is the last of the three possible location to find Tolfdir's Alembic. The next cubicle contains an alchemy lab with sets of shelves on either side and a couple of barrels containing ingredients and a chair to the left and a wooden bench to the right. The shelves hold two bowls of troll fat, a taproot, two bowls of spriggan sap, a salt pile, two Nordic barnacles and a nirnroot, an imp stool fungus, a scaly pholiota fungus, three blue, two purple and one red mountain flower, a potion of minor magicka, a potion of magicka, a potion of minor healing, a potion of plentiful healing, a potion of regeneration, a paralysis poison, two swamp fungal pods, a sprig of snowberries, a sample of slaughterfish scales, a sample of hagraven feathers, a bowl of bone meal, two dragon's tongue flowers, a bowl of fire salts, two bowls of ectoplasm, an orange dartwing, two rock warbler eggs, and a piece of canis root. Everything in this room is unowned and free to take. The next cubicle is Colette Marence's sleeping quarters, it contains an owned single bed coming out from the wall with end tables on either side. The one on the right has six loose septims on top. To the left of the bed are two sets of shelves separated by a tall wardrobe. On the shelves are two potatoes, two apples pies, four red and two green apples and in front is a lute. To the right of the bed is an unlocked long chest with two wall shelves above it. These hold a staff of lightning bolts, a dragon priest dagger, and an Orcish dagger. There is also a drum on the floor. The final cubicle only contains a couple of crates and barrels. 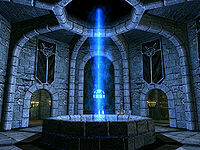 It is also the location for finishing the quest to assist Arniel Gane discover an ancient Dwemer secret. The stairwell continues to the top and a door out onto the roof of the main walls and access to other areas in the college.